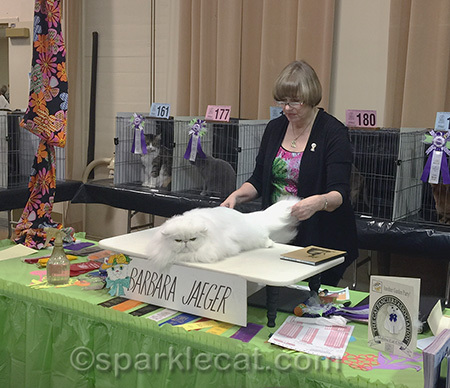 I competed in a one-day cat show near our house this weekend. But just because it was only one day and six rings, it doesn’t mean it was easy. Totally the opposite, in fact — the current season only has a few weeks left so cats who are competing for national and regional titles are trying to rack up as many points as possible. 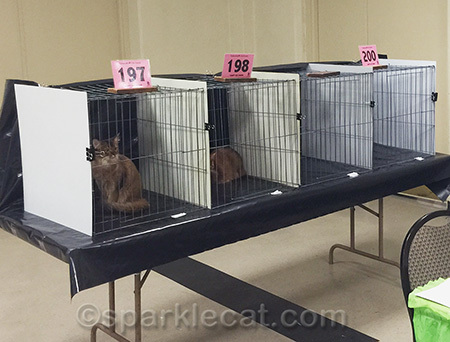 The maximum number of cats entered this show. 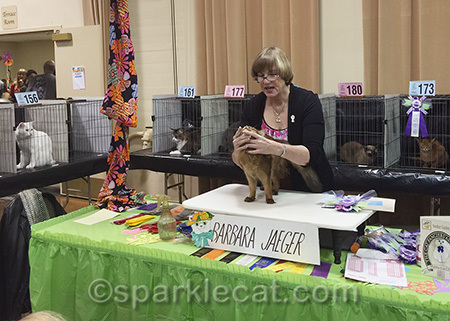 There were well over 40 cats in Premiership (my class), and some of the very best cats in the country were there! I knew I had to work extra hard to be noticed. I had to make extra-sure I was clean! My human always gives me a bath and groom the day before, and touches me up all throughout the show, but it takes my special touch to make it perfect. She does not always agree. I also spent extra time doing all my facial exercises! I’ve been competing as an adult for nearly three months now, and there are younger cats coming up. This is not just a facial exercise — it’s a stress reliever, to keep away stage fright. 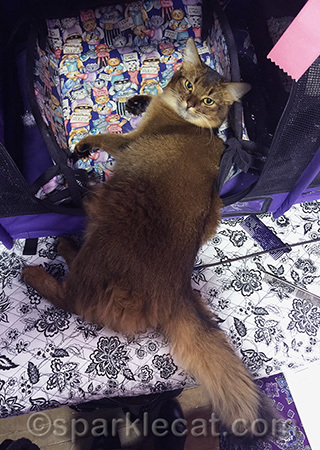 This was also a special show because one of the very top cat photographers was there, and my human had him take pictures of me! I have to say, though, I am not so sure I liked him. I mean, he seemed nice enough, but he said I was a brat because I didn’t want to stay on the table and look at his toys. I wanted to jump down and wander around with him following me, like my human does. For some reason, that was not allowed. “I bet she always gets her way at home,” he said to my human. Well, duh! Why wouldn’t I? In any case, he managed to get some really awesome pictures in spite of my so-called being “spoiled.” I can’t wait to show them off! Here I am in the judging ring, waiting for my turn. I was 197. There were a couple of other Somali cats competing this time, but they were both just Premiers, not a Grand Premier like me. When you are a Grand, you have an edge over the cats who haven’t earned enough points to Grand yet. 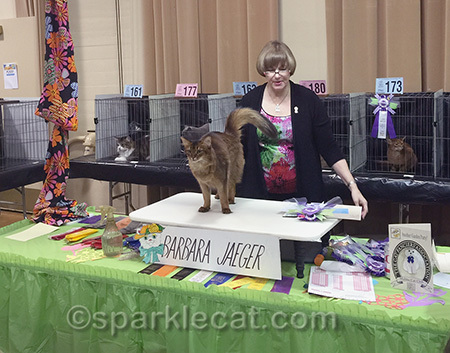 I was best Somali in every ring except the last one, and I knew the other cat was going to win it because she was having an extended conversation with the judge. Yes, he was talking back to her meows! That’s okay that she won and I got second, it was kind of a cute interchange. But just because I got Best Somali Premier, it was no guarantee I would place in any of the rings. Like I said, the competition was fierce, and the best of the breeds were represented. Here is one ring I did final in. She put me on the table when she was talking about me during the final. Here she was talking about my profile and ear set. Like I mentioned in my 20 Facts post, this is one of my good points as a show cat. And here she is talking about my nicely wedge-shaped head. 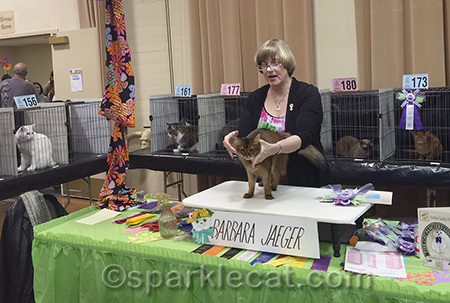 All the judges do that head crank to examine us, so breeders train us as kittens to accept it. 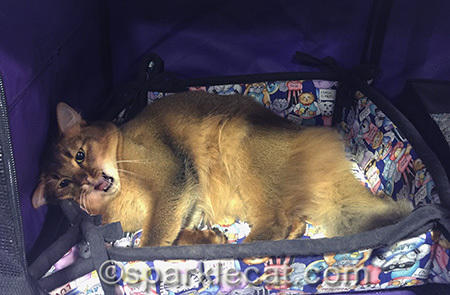 I don’t mind it at all, but when my human tries it on Binga, she is a little stiff! 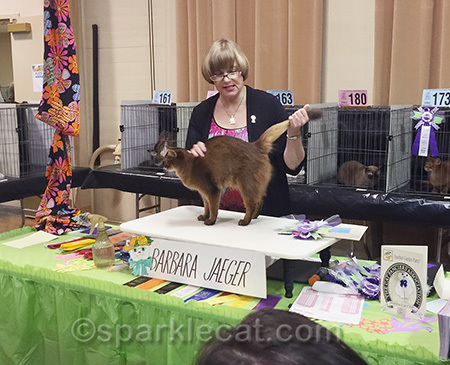 This is my favorite part of being on the judging table — just standing there and looking at the audience. I came in sixth in that ring. If you are wondering who came in first, it was this guy, Cinema’s Liberace of Wishes. When the judge placed him on the table, it was like a cloud floating down! Maybe you remember him from a previous show of mine. That was his first show as an adult, and he became a Grand in just that one show! He came down from Idaho to compete, so his owners are working very hard to get him as many points as possible. He is younger than me by about six weeks, but he is already making a mark. By the end of the day, I was so exhausted that when my human tried to get me out of my Sturdi enclosure, I didn’t want to move. But it was a good exhaustion because I finaled in three rings altogether! For a show as tough as this one was, that was awesome! 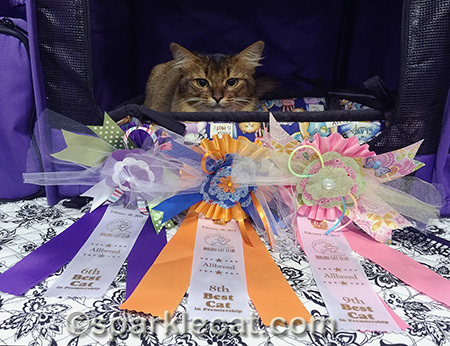 I think you did great at the catshow , Summer and conCATulations to the pretty ribbons ! 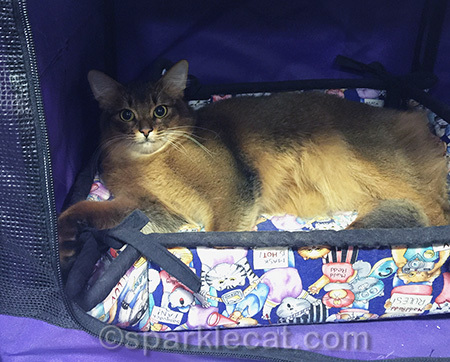 It is so fun seeing your cat show adventures. It is great seeing that you are doing so well too. Pawesome! We are late, and catching up but would not have missed this post for the world. You rock Summer 🙂 well done with the amazing pose, the pictures an the Indie Spirit!! Summer, you work very hard for such a young kitty! We are impressed with your success. Yay, Summer! Concatulations! You should be very proud of yourself because not only are you a beautiful show cat but you are very brave, too. You’re such a well behaved a lovely kitty. 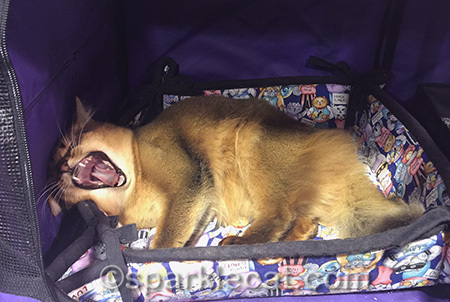 I can’t see any of mine taking to cat shows very well! WOW! That was a lot of work! We loved your poses and pictures! So glad you finaled in three rings! Awesome! Love all the pretty ribbons. Maybe your human can take a photo of all the ones you got so far.